This post appears courtesy of Burson-Marsteller and the full study can also be found on their website, here. Almost 90 percent of all governments have an official Facebook presence, and 87 heads of state, 82 heads of government and 51 foreign ministers maintain personal pages on the platform, according to a new study by Burson-Marsteller. Based on data collected in January 2016, the World Leaders on Facebook study – the first installment of the 2016 edition of Burson-Marsteller’s annual Twiplomacy study – found that 169 of the 193 UN member states maintain an official Facebook page. Over the past eight years, Facebook has become the channel of choice for community engagement with world leaders. Many politicians discover social media channels during election campaigns, such as the Barack Obama page, which was set up in late 2007 as an electoral tool for the former Senator of Illinois. Since then, a Facebook presence has become part and parcel of any social media political campaign and one of the best ways to engage with potential voters and citizens. According to Facebook’s latest figures, 1.5 billion people have registered an account on the platform, of which 1 billion people are active on the social network every day. In 2015, the number of users on Facebook has become even greater than the population of China, the most populous country on earth. Government use of Facebook varies from country to country. While some pages merely broadcast the daily activity of their leaders, others engage with their citizens, replying to the most salient comments and even allowing a free flow of visitor posts on their respective pages. Much like any other Facebook user, world leaders share their private lives on the platform: celebrating birthdays, sharing pictures of their children, celebrating their latest offspring or grieving the passing of their parents. These type of personal posts are typically the most popular. The most popular post of all world leaders was posted on the White House page, a family picture of the Obamas wishing their fans a Happy Easter, with 2.9 million likes, comments and shares. The second most popular was Narendra Modi welcoming Barack Obama to India, followed by a White House post showing Barack Obama hugging his wife Michelle on their wedding anniversary. Family pictures posted by the royal families in the UK, Sweden and the Netherlands are especially appreciated by their fans. The best performing pictures of world leaders on Facebook often show a lighter side of their personality such as Turkish President Recep Tayyip Erdoğan riding a bicycle, HH Sheikh Mohammed bin Rashid Al Maktoum, the Ruler of Dubai barbequing in the woods, and Cambodia’s Prime Minister Hun Sen enjoying the beach. Posts on religious holidays such as Christmas, Easter, Eid al-Fitr and Thanksgiving are generally appreciated such as Argentinian President Mauricio Macri decorating the Christmas tree with his daughter and Canadian Prime Minister Justin Trudeau trick-or-treating with his children at Halloween. Messages of sympathy and support of Paris following the terrorist attacks were the most ‘liked’ posts on the pages of French leaders in 2015 as were the messages of sympathy to the French people from other foreign leaders including David Cameron, Benjamin Netanyahu and Justin Trudeau. The most popular political statement posted on Facebook by far was the decision on marriage equality in the US, with Barack Obama’s post “Love just won” receiving 1.8 million interactions on his campaign page. Facebook has become the place where leaders can reach out to their citizens and have conversations in more than the 140-character limit allowed on Twitter. 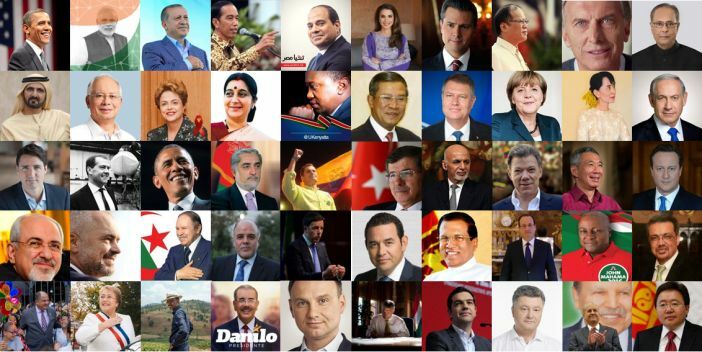 With their publications on Facebook, world leaders can now reach an audience of millions of users worldwide, regardless of the number of likes on their respective pages. Engaging Facebook posts often make headlines in mainstream media and have long become more powerful and effective than traditional press releases. For a more in-depth look at how global leaders use Facebook, please visit Burson-Marstellers’ World Leaders on Facebook report.